Used for thousands of years as a reliable painkiller, and is often called "herbal aspirin". It is believed to help with arthritis discomforts and has been used for reducing the swelling and inflammation., eventually increasing mobility in knees, hips, and other joints. Willow bark extracts may help to reduce acute and chronic pain, including a headache, migraines, backache, neck pain, muscle aches, nerve pain, menstrual cramps, toothache and the pain of minor injuries. White Willow Barks analgesic actions may be slower-acting than a synthetic aspirin, but the results last much longer, as the painkilling compounds remain in the bloodstream longer. Unlike aspirin products, it has no effect on blood platelets and doesn't increase bleeding, and will not irritate the lining of the stomach, a common side effect of aspirin. 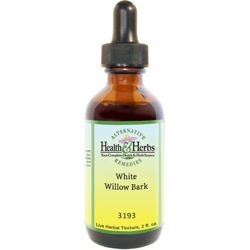 Willow Bark tinctures act as an anti-inflammatory and has been used to relieve the painful inflammation and joint pain of rheumatism, arthritis, gout, neuralgia, osteoarthritis, osteoporotic and lower back pain and the inflammatory stages of autoimmune diseases. It may also be an effective alternative for people who can't tolerate non-steroidal, anti-inflammatory drugs. White Willow Bark is a bitter, astringent, cooling herbal extract, that is known to reduce fevers, increase perspiration and cool the body. It is good for minor feverish illnesses, chills, colds, etc. White Willow Bark is an antiseptic. The compounds in this herb are helpful in treating kidney, urethra, bladder and other urinary tract irritations. It has also been used as a remedy for diarrhea, dysentery and minor infections. When used externally, White Willow Bark's antiseptic properties help in treating cuts, burns, wounds, sores, sweaty feet, dandruff and as a mouthwash to ease tonsillitis, sore mouth, and sore gums. White Willow Bark is high in tannin content, and it is believed to help with gastrointestinal disorders, such as sour stomach and heartburn. Ingredients: White Willow Bark, Structured Water, 20% Alcohol. Non-Alcohol: White Willow Bark, Structured Water, Vegetable Glycerin. Contraindications: Those who are allergic to aspirin should not use White Willow Bark, and the herb should not be taken in combination with aspirin. It is not recommended for pregnant and nursing women without first consulting a healthcare provider.